What a joy this book is! It has been several years since the only book that had actual photos and descriptions of daily life in a Waldorf kindergarten went out of print–and the loss as been palpable. 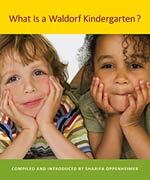 This beautiful little book fills that gap in a wonderful way and goes even further in describing the goals and ways of kindergarten education within the Waldorf approach. I am so happy that this book has found its way into print, and am confident that it will find its way into the hearts of parents and teachers and emerge as beautiful environments in which young children will grow and be glad. “Baking, washing, sweeping, mending, singing, painting! Imagine the scent of bread baking, the warm sudsy water for washing the dishes, the muscle power of sweeping, the fine eye-hand coordination of mending and sewing. Imagine the visual education in the dancing watercolors. And if you have had the great pleasure of sitting in the midst of children’s creative, imaginative play, you will know the happy sound at the heart of this beehive of activity. Research shows that three essentials are necessary for the young child’s learning: a broad palette of sensory experience, vigorous and fine movement in response to sensory input, and the opportunity to imitate what the child sees modeled in the environment. These activities are the backbone of the academic foundation that parents look for in an early childhood program.